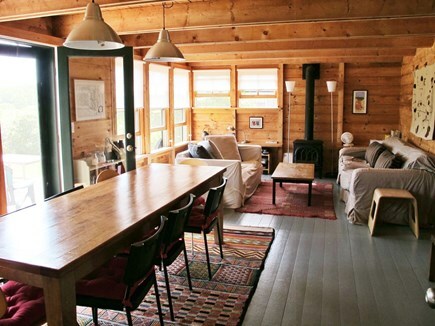 Bright sunny architect designed contemporary ''classic'' Vineyard beach house with weathered shingles, post and beam construction, exposed beams, pine siding and wood floors throughout. 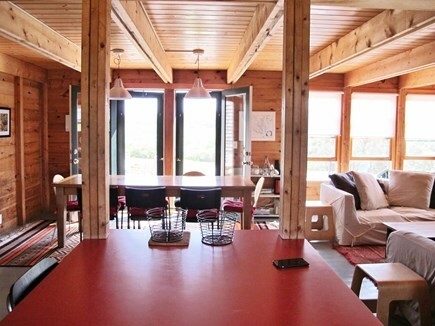 A unique design of two houses connected by a screened breezeway (with barn doors that can be closed during inclement weather) makes it ideally suited for a large family, or two families vacationing together. The main house has an open floor plan downstairs and includes living-dining area, kitchen and mudroom. The master suite located on the floor above. 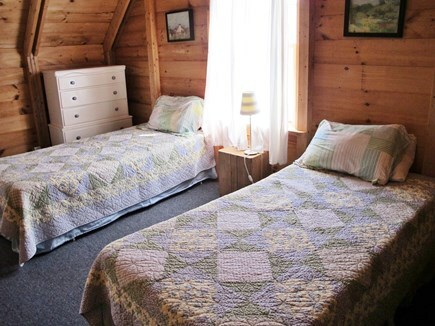 The 'bunkhouse' offers two bedrooms (1 queen and 1 full futon) and a full bath downstairs, and two bedrooms (2 twins/room) and a full bath upstairs. 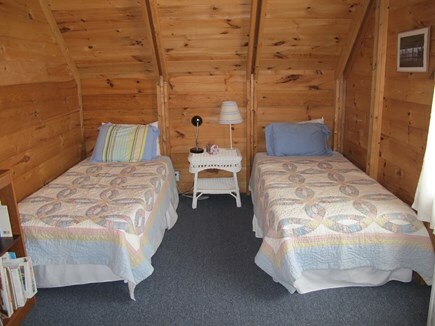 There is an enclosed outdoor shower off the side deck and a large back deck, with views over open fields. 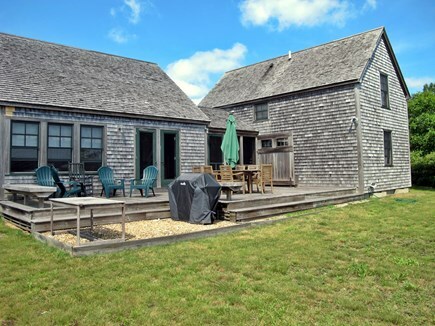 The house has 'up-island' charm and convenient access to Edgartown and West Tisbury, and is located near Long Point Beach and Wildlife Refuge maintained by the Trustees of the Reservation. 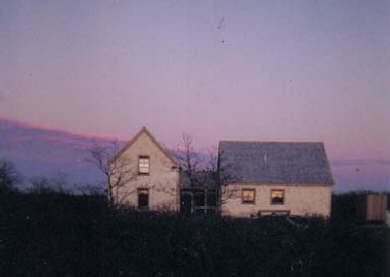 The fields surrounding the house contain some of the island's most beautiful walking trails and 'ancient ways' leading you down to Long Point Cove. Bring your bike and use the bike trails to ride to Edgartown, or to explore the State Forest. There is easy access by car to Long Point Beach and South Beach. At the end of the day use the outdoor shower to rinse off sand and salt, then relax on the deck or in the screened porch. 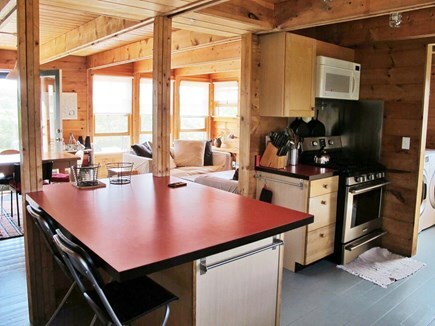 Long-Term Rental (1 month or more): Long Point Area. 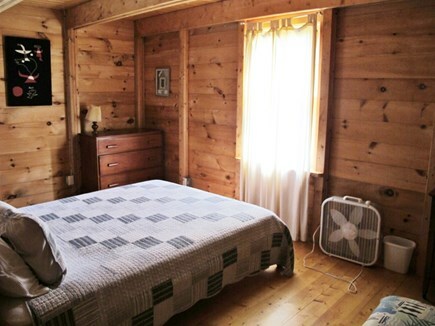 Monthly off-season & winter rentals available October - May. 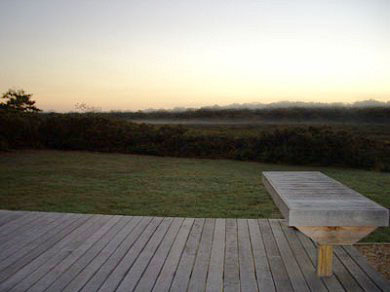 Warm (new gas heat ), quiet house with great meadow views off Edgartown-West Tisbury Rd. 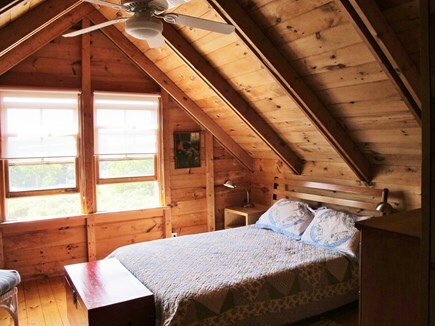 Sleeps 10, 4 bedroom + den/bedroom. Convenient to Edgartown West Tisbury and VTA transit. Please contact owner for rates and details. Additional pricing info: Cleaning charges are not included in pricing. State and local taxes of 9.7% will apply.